The deepest foundation of our physical world. The Discovery of the Matrix as the ultimate basis of physics requires new Paradigms. The problem is: Shell I first questionize the old paradigms or explaine first the new ones? Because of the better understanding, this article is divided into 3 parts and offered as PDF in English and German for downloads. 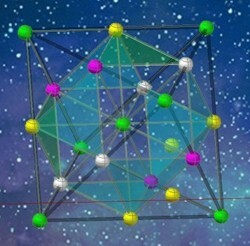 Part 1: The space matrix is explained and depicted. Part 3: The new paradigms are newly explained. What is actually the new field theory? In short: It is based on harmony and balance of the primal phenomena that generate space-time-pulse. These phenomena (axioms) exist from the beginning, but because of this balance or equilibrium they form a void, a non-visible, non-interactive substance of empty space. Only the disturbance of this system generates the reality of space-time-pulse. In contrast to today's physics, the Matrix-Field-Theory (MFT) does not begin with an absolute chaos of a big bang scenario but with an almost absolute harmony, which forms a perfect void by the equilibrium of the space-time-pulse axioms. The empty space is not empty; it is a system of space-time-pulse that in the state of equilibrium, in perfect balance, has no effect outside its system. Disturbances of the system, however, form their own systems, which in turn form superordinate systems in equilibrium up to the universal size. A Quora-Member asked me: What is the substance of the light? Light is not a substance because a wave is not water. Not the hammer hits the nail, but the blow drives the nail into the wood. Light is the blow (the impulse), the hammer is the space of the electromagnetic field and can transmit not only light, but also the unimaginable forces of a neutron star. But it also finds its master where it collapses and bends into another spatial dimension, where mass as a phenomen occurs and time gallops in both directions on its axis, there it is where the following considerations will lead us.